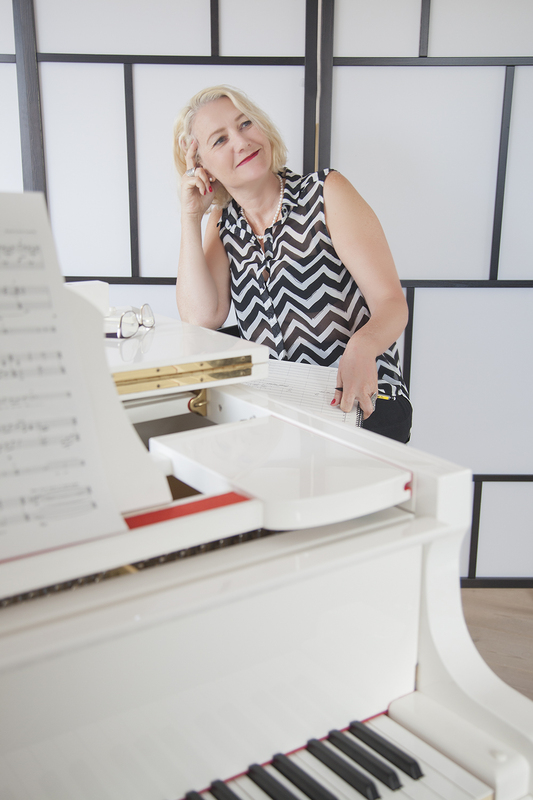 Anna-Lena Laurin (born in Halmstad, 1962, resident Malmö/Sweden), is a classical composer. She has worked with orchestras such as; Royal Stockholm Philharmonic Orchestra - who commissioned Iphigenia (2009), for full symphony orchestra and 2 improvising jazz soloists – at the premier Anders Bergcrantz - tr and Richie Beirach – pf; Thomas Søndergaard conducted. This world premiere was broadcast within a composer portrait of Laurin six times in Swedish TV. Laurin has worked with many great artists such as Håkan Hardenberger, Gitta-Maria Sjöberg and Andrew Manze and her music has been premiered in the presence of Magrethe II of Denmark. Laurin writes complex orchestral music with strong melodic and rhythmical components. It is recognized by a dark soulful as well as a light lyrical tonality. She is very often found creating her own genre with her ability to involve improvising jazz musicians into her contemporary orchestral works in a personal way and was appointed Composer of the year by Swedish Radio for her ability “to create a succesful crossover between the jazz’s and classical music’s language and the courage to write music from her heart without leeking at prevailing musical trends” according to the motivation of the jury. Concerto for flute strings and harp (2009) was commissioned by Camerata Nordica and Musik i Syd to celebrate the 100 years anniversary of the city Eslöv, and was nominated for The Swedish Music Publishers Association’s Annual Music Publisher’s Award 2011 as one of the most important works in Sweden this year. With this kickoff, Camerata Nordica and Terje Tønnesen – artistic leader of Camerata Nordica as well as concertmaster with the Oslo Philharmonic Orchestra - started a long collaboration, 2011-2015, including 4 concertos of Laurin. Camerata Nordica will premiere, commission, record CD:s/Swedish Radio, tour - with her concertos, which also includes a guitar concerto especially written for the Deutsche Grammophone artist Göran Söllscher. Selected works: Persephone (2011), for symphony orchestra and hammond quartet, prem. 2012; Concerto in memoriam, (2012), for tr, str, prem. 2014; God is not mute, (2011), for Mzs, pf, lyrics Björn Ranelid, (lyrics are available in Swedish, German, English, French); Quest, (2013), for S and symphony orchestra, lyrics Laurin, prem. Malmö Arena 2014, Gitta-Maria Sjöberg, Malmö Opera Symphony Orchestra; Shards of time (2010), for solo pf, com. by Eslövs Kommun, prem. within a portrait concert of Laurin at Villa San Michele, Capri, Italy, 2010, Martin Sturfält; Where the sun rises (2010), 8" for 6 perc, written on request from Li Biao, prem. Berlin 2011; String Quartet No 1 (2004). Selected recordings: Dance in Music, 1995, DRCD262; Piece from the silence, 2007, VMBCD105; Anders Bergcrantz Plays The Painter By Anna-Lena Laurin, 2013, VMBCD108. Awards, selection: 2013 appointed Composer of the year by Swedish Radio P2 in their annual award Jazzkatten; 2010 Society of Swedish Composers Award; 1995 Award from the City Malmö; 1995 3rd prize Academie De Musique, Prince Rainier III for - Dance in Music; 2001 The Royal Swedish Academy of Music Grant.